The Department of Classical Studies offers courses in the languages, literatures, history and archaeology of ancient Greece and ancient Rome. These two cultures are the intellectual, social, political, legal, scientific and artistic origin of Western civilization. Along with the Hebrew Bible, the scholarly investigation of these cultures is the original subject of university study. Their brilliance and beauty have not ceased to beguile and inform students for more than 2,000 years. Classical studies encompasses all aspects of life in Greece and Rome. In addition to their aesthetic, spiritual, moral and intellectual value, classical studies has practical uses. The study of Latin is a proven key to communication skills in English and the Romance languages, and both Latin and Greek continue to be sources of technical concepts and vocabulary in all fields of study, from cybernetics to political economics. You will learn about all aspects of life in Greco-Roman antiquity and the knowledge you gain will enhance your appreciation of a range of disciplines, from art and architecture to philosophy and religion, from history and politics to ethics and religion. Choose one of three tracks: Classics, Greek or Latin Literature or Classical Archeology and Ancient History. Our unique program enables you to choose between two tracks of study: Ancient Greek and Roman Civilizations, and Greek and Latin Languages and Literatures. And because of Brandeis' commitment to excellent, caring teaching, you'll receive close mentoring from some of the finest faculty in the field. Stephen Guerriero, MA’16, is a leader in his department at Needham Public Schools. 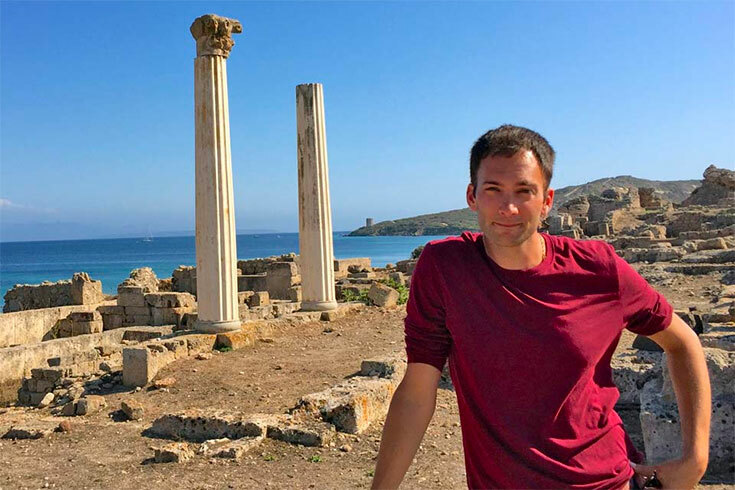 He uses his extensive expertise to design engaging social studies courses, which include curriculum based on archaeology, Ancient Greece and Rome, Egypt, and the Near East.